Buddha Maitreya the Christ offers a daily Dharma Teaching with World Peace OM Meditation; normally lasting about two hours and usually broadcast live from Buddha Maitreya the Christ's Shambhala Dakini Monastery for Planetary Healing, located in Northern California. This is an auspicious opportunity to meditate with the incarnation of Buddha Maitreya the Christ and his wife Mandarava Tara (the female incarnation of the Bodhisattva Tara) for planetary healing, the healing of humanity and to receive Buddha Maitreya's healing blessings. Buddha Maitreya teaches about virtue and harmlessness and how he transmutes glamours unconditionally through meditating with people and through blessing his Monastic Meditation Tools (aka. 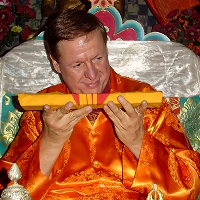 Shambhala Healing Tools) so that everyone can receive his transmission of virtue and the offering of His Incarnation. Experience the OM Meditation and be a part of a healing force for the World! You are able to join virtually the excitement of [replay for UK] World Peace OM Meditation & Dharma Teaching. Watch a high quality LIVE video stream brought to you by Buddha Maitreya the Christ. Enjoy, interact and watch the live feed from any of your internet connected devices. On Feb 14, 2019 18:30 GMT to Feb 21, 2019 23:55 GMT you will come back here and watch the show LIVE!! The Buddha Maitreya Shambhala Monastery team will be providing a video on demand replay of this event within the next 24 hours after the completion of this event to watch at your convenience. On behalf of Buddha Maitreya the Christ Cleeng teams provide support before, during and after the event. Due to high traffic just before and during the event, critical requests will be handled first, so please moderate your questions and only send if very urgent. Please try not to send multiple requests.